We hope you’re hungry for salmon! Our local captains show you the best of the area on this memorable fishing experience. Hit the best salmon fishing spots, spot Juneau wildlife like bears and eagles, and make some family memories. There are tons of salmon to catch in the area, and our crew makes sure to take you to some favorite locations. Even if you don’t have fishing experience, you’re likely to catch something on this trip. For those of you visiting on an Alaska cruise ship shore excursion, our trips are tailored to get you right to the heart of the action and back to your boat in a timely fashion. Everyone who is 16 or older and who is fishing needs to have a current Alaska or Yukon Territory fishing license. 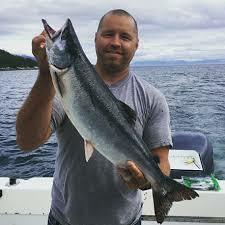 Fishing licenses are available on board.. A one day (24hr) license is $25, if you are salmon fishing during May or June, you can expect to need to get a King Salmon stamp, $15. If you are fishing later in the season, the stamp is optional and only if you intend to keep Kings. Multi-day licenses are also available onboard.